The following letter was submitted by Linda Tone who was kind enough to share her thoughts after attending the ToML meeting on June 16th. My parents purchased this property in the 70’s after having to leave Silver Sands Campground due to unforeseen circumstances . With heavy hearts they searched and searched for the perfect piece of land, and found it. They worked for 4 years to clear the land as we lived in Toronto and both of them were working during the week so they could only come up on weekends and holidays. After all their hard work and tireless effort their dream was a reality- Cedar Shores Campground was open in 1978/79. My parents loved Muskoka so much they wanted to share all the beauty and solitude our great area supplied with no effort on Mother Natures part. Not very big but very private- some people don’t even know its here. Dad and Mom were involved the Deer Feeding Association in the winter soon after moving up here and in a few years had up to 68 beautiful deer right in our backyard. Travellers on the road would see them and stop at the top of the driveway and my parents would ask them to come in and have tea and watch them up close through the big picture window in the basement, in the middle was my Mom talking to them and putting seed down as if she were talking to a group of kids- it was amazing. Our little lake -Slocombe- was stocked for the campers to fish in . To this day we do not allow gas motors in our lake, you row ,canoe- kayak, use an electric motor , or fish from the shore. Unfortunately the Pike have come from a surrounding lake through the water system that connects all our lakes, in one way or the other, either underground or above ground. They are a very invasive species . We have first – second – and third generation campers here and have people looking for spots all the time, but alas we are at capacity. My parents have since passed away and left this beautiful Campground in the families care to keep their dream alive. Making sure that we keep our promise not to make drastic changes to the property to harm the wildlife or surrounding bush area. There are turtles, painted and snappers, deer, turkey vultures, and other wildlife on the roads all the time and I have stopped numerous times to help get them off the road, so periodically there are two or three cars stopped on Muskoka Rd. #3- not very good or very safe if there are going to be more large trucks on the road- at 80klms in this section I doubt that a large truck loaded or not will be able to stop that quickly. In building the proposed Pit, I am afraid even as far away as we are from it that our little lake will be harmed , our beautiful rocks that are all over our property will be stressed, the poor animals that live in the area will be tortured by the noise, the campers – our family trying to get out of our driveway all of this will be a life threatening issue for all. What about the Postal Person that makes frequent stops at the driveways to deliver mail, people trying to get out of Old Aspdin Rd. how about the multitude of Motorcycles and Car clubs, of Bicycle groups and joggers that travel this road and the neighbours that have to walk on the road to get to their mailboxes. I do understand that this is a short cut to Parry Sound , the road to the Dump, to beautiful Skeleton Lake and all its cottagers, to other campgrounds , to Rousseau , but putting 70% more trucks on our road seems a little drastic and unnecessary, and a detriment to the road quality which will certainly change with all the excess weight that will be added to it. We were at the meeting and I listened to all of the statistics about the rocks fracturing, the lakes, the air quality, the noise ,the safety to wildlife and most importantly the people that live in the area. It was also stated that there are 9 pits already in Muskoka- we need another one WHY?? One comment was that the pit will fail because of that- too many already. This pit will not benefit Muskoka but destroy it. Our Green House Gas issue is severe enough , lets not add more problems to our air. How much more with the Health system have to spend to keep us healthy if this gets approved. I don’t want to see my old age suffer because someone wants to make more money. If money is the issue build something that will benefit the Muskoka area- we need more housing- a seniors home- hey even another campground will bring in money for the life of your family- trust me I know. On closing I wish to say that I pay taxes on two properties, and my family has a vote up here, I hope that counts for something. Please see your way to not allowing this Pit to become the biggest mistake you will have to live with the rest of your life. MNRF objection letters are to be sent to both addresses or emails below by July 10, 2017. Objection letters must contain the objector’s complete postal mailing address where a response can be delivered, or the objections will not be considered acceptable. This application is for a new pit and quarry. The Annual Tonnage Condition applied for is 200, 000 tonnes. A detailed site plan and reports for the proposal may be examined at the Township of Muskoka Lakes or at the Bracebridge Ministry of Natural Resources and Forestry office. Any person(s) wishing to object to this application must send, in writing, their objection with reason(s) to the Applicant and the local office of the Ministry of Natural Resources and Forestry at the addresses below. Note: E-mail submissions are acceptable; however they must contain the objector’s complete postal mailing address where a response can be delivered. E-mail objections which do not contain a postal address will not be considered acceptable. The last day on which objections may be filled with the Applicant and the Ministry is the 10th day of July 2017. Note: All information in respect to this application including written support or objections, the names and address of any objector(s) is available for public review for the purpose of this application under the Aggregate Resources Act. In submitting a written objection an objector consents under the Freedom of Information and Protection of Privacy Act to its disclosure for the purposes of the application. I’ve been coming to our family cottage at Skeleton Lake for more than sixty years, and I have always loved the natural beauty and tranquility of a place that has no equal in my experience. I was very upset recently, when I learned that Frank Lippa has applied for amendments to the Official Plan of the Township of Muskoka, that would allow him to develop a large-scale pit and quarry, less than 2kms from Skeleton Lake, and very close to our cottage. Over the years, members of my extended family, and friends from around the world, have enjoyed staying at Skeleton Lake, and we have done our best to support the local economy, building cottages and permanent homes, paying property taxes, buying furniture, shopping for groceries, and visiting bars and restaurants. If the Lippa application succeeds, and the quarry development is allowed to go ahead, this will be devastating, not only to my family, but for all those, who live close to Muskoka Road #3 between Huntsville and Rosseau. On average, more than 100 loads of sand and gravel per day will be carried in large trucks on this small winding road, with 70% of the trucks going towards Huntsville and 30% of the trucks going towards Rosseau. These trucks will pose a serious threat to local residents, and to those tourists, who choose to take this road, which has been designated as a scenic route. The trucks will also pose an ongoing threat to the abundant wildlife in the area, including moose, deer, porcupines and snapping turtles. Most tourists come to Muskoka to enjoy the natural beauty and tranquility of a place that is renowned throughout the world. These tourists don’t come to see gravel pits and hear dump trucks! I love Muskoka, and if you love Muskoka, please go to stopmuskokapit.ca, and join me in the campaign to stop the pit! You may not know that our tourism, Skeleton Lake, Lake Rosseau and Lake Joseph are under a horrifying threat by a quarry looking to get started in a key area impacting multiple townships and cities including Huntsville. At 100 metres deep in its centre, our ‘Impact Crater’ Lake is very unique. It is spring fed and uniquely clear. The damage of blasting could forever remove this amazing lake, which runs into Lake Rosseau and Lake Joseph…so the ripple effect could be significant. Want to know more, sign a petition or join us on June 16 at 9 a.m. for a public meeting (FB: StopMuskokaPit). In addition to the broader ecology impact, Aspdin Rd would become the main thoroughfare of approx. 100 trucks a day, 7 days a week. The pit is planned for 1089 Butler Mill Road. Our experience with quarries is specific. We lived in Washago with a quarry several miles away, not as large as the one being proposed, and every day the ground shook the house when they blasted – but that was nothing compared to the damage to the road, which could not be maintained because of poor planning on the town’s part. The volume of trucks was bad enough, but not as bad as when the road had pot-holes. The trucks would rattle so loud it was impossible to ignore – like a shotgun by your ear as the back-end loaders banged against their mounting. Here, in the summer, we have a very busy road with tourist traffic travelling within the region right past our business and home. If the quarry goes in the serene drive may look like Toronto on a weekday at 6:30 p.m.! We have received much information re the above quarry/pit. To our horror it is unbelievable that the township is seriously considering their proposal/rezoning. How could council even consider changing a zoning that was designed to protect the environment & most importantly the safety of your constituents. A) The quarry is not outside the 2 km boundary of the water front set back. B) The total disregard for the environmentally sensitive zoning that exists around the site, which your predecessors had the foresight to establish. D) The damage to the tourists industry will be catastrophic. People come from all over the world to enjoy & experience MUSKOKA. E) The safety of Children getting on & off school buses are more than enough reason to turn down this rezoning. F) Muskoka 3 is not a provincial highway & is not built to with stand the volume of trucks proposed. Who will be responsible for the major road repairs that will occur. Five generations of our family have made Skeleton Lake our place of solitude during all four seasons on a lake that is second to none. We totally disagree with the development of the pit and quarry that will destroy the tranquil natural habitat and surrounding area. There is a reason why this area is currently not zoned for this intrusive industry and associated business. Skeleton Lake has a natural limestone base. To have blasting in less than 2 km will crack the natural stone, allowing contaminants/mercury into a pristine lake. It is presently the only lake in muskoka that does not have mercury contamination. Stop it now before it is too late. Following is a letter from the directors of the Rosseau Farmers’ Market. It was sent to all vendors (about 150) and this letter has been forwarded to the mayor and council. On June 16th at Port Carling, Mr. Frank Lippa, is going to apply to the council of the Township of Muskoka Lakes for permission to open a rock/gravel quarry and pit on Butler Mill Road. This operation would take 200,000 tonnes of material out of the pit annually. If this application is approved by the council of the Township of Muskoka Lakes, it would mean more than 100 heavy gravel trucks a day on Aspdin Road, (one every 4 1/2 minutes). Some of them would be going east to Huntsville, some would be going west to Rosseau. One major concern is for the safety of vehicles, pedestrian and bicyclers on the roads. Heavy gravel trucks are not able to stop on a dime. School buses that are stopped on the road would not have a chance if a gravel truck came around a corner and was not able to stop. There are already too many heavy trucks using this road on a daily basis, such as logging trucks, Muskoka Containerized Services trucks, Panolam trucks, Hutcheson Sand and and Gravel pit trucks, to name a few that use this road. Aspdin Road is not a provincial road and was not built for such heavy traffic, and extra 100 trucks a day would wreak havoc with the road, with visitors, with residents and with the wild life. Residents, through their taxes, would have to foot the bill for repairs to the road and would have to live with the dangers of living on a road with such heavy truck traffic. Not acceptable. Another major concern is that this pit will be operating below the water table. The water and the pollution from that operation will flow into Skeleton Lake and then on to Lakes Rosseau, Muskoka and Joe. This is simply not acceptable. It is the belief of the directors of the Rosseau Farmers’ Market that this amount of heavy truck traffic will pose a serious risk to pedestrians in the village of Rosseau. The major economic engine in Muskoka is tourism. Rosseau Farmers’ Market draws an average of 3000 visitors on market days. The market is located on highway 141, which is the road that those huge gravel trucks would use. As it is, Rosseau has very heavy traffic congestion on market days. It is our belief that additional heavy truck traffic would result in accidents and deaths. 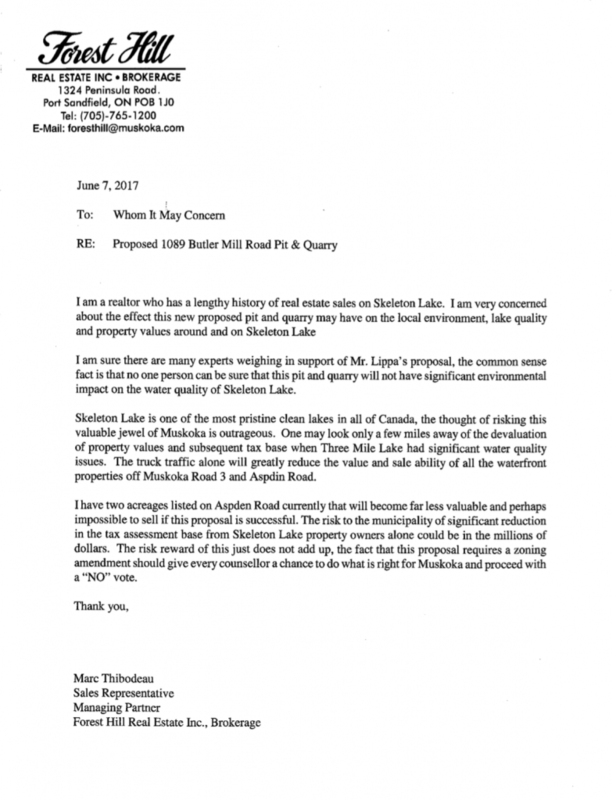 We very strongly urge the Township of Muskoka lakes to deny this application. The huge stone quarry proposed in Muskoka Lakes Twp. location on Butler Mill Road should be raising eyebrows and flags at this proposal. The effects if approved will not only effect resident & cottage owners in Muskoka Lakes, it will also effect tax payers of Stisted/Stephenson Wards in the Town of Huntsville, The Village of Rosseau and Severn Twp. and beyond. Very Much increased truck (semi) traffic from Butler Mill Road west to hwy 400, east to hwy 11 (Huntsville). Sight lines on these roads are not the best anytime now without increases of heavy duty 18 weelers. Traffic east will most likely take the shortcut down Domtar/Old Muskoka Rd/Allensville Rd. to reach Hwy 11 south. Both east and west routes are daily school bus runs, regular rural mail delivery routes, and more importantly many roadside residences with children at play. Truckers for the most part do not keep regular work hours as most of us are used to. Their operating schedule for most independent truckers to earn their bread & butter is a schedule of any part of 24/7. Everyone along or nearby those routes will experience noise levels anytime of day of braking(jake) gearshifting, near misses or we pray no collisions when exiciting on to Aspdin Rd(muskoka rd. 3 west). If this rezoning is allowed maintenance of Muskoka Rd 3 west(Aspdin rd) will be a direct cost to ALL taxpayers of Muskoka and probably the District Engineering and public works budget will increase dramatically. Needless to say Tourism one of our major income generators in Muskoka does not mix well with, noise, dust, fast truck traffic. The Aspdin Rd. could become the most feared to ones safety to travel on in Muskoka, similar how many, many fear for their safety while travelling the 401 through the GTA. Possibly one of the most important , might be the most important issue with approval of this quarry is this consequences and effects of Skeleton Lake. Most of the lake is in Muskoka Lakes Twp, however a good portion of its shoreline is in the Town Of Huntsville. The Geological make up of Skeleton Lake with its lake bed made of a limestone shield may be so unique that possibly no where else in Ontario can this be found. If rock blasting as much as disturbs this shield , no money in the world can repair the damage. The proposed quarry is very close by at less than 5 to 10 km. A public meeting regarding the proposed quarry was held at the Aspdin Community Centre on Sunday June 4th. There was standing room only as Mr. Ross Earl and his many volunteer residents gave an excellent overview of whats happening and discussions on what can be done to STOP the rezoning. Representatives from mostly the area most directly in the vicinity of the quarry were in attendance. Representatives from the Skeleton Lakes Association were there as well. On a sad note of who was NOT there, there were not any members of Twp of Muskoka lakes council or from the Town of Huntsville council. As a former Town of Huntsville & a District of Muskoka councillor I always felt it was my duty as an elected official to attend any public meeting to keep my eyes and ears close to the taxpayers who elected me to serve. If I happen to have conflict in attending such events I often would ask a trusted friend to attend in my place to listen, take notes etc. There is still limited time left for all those elected officials to get on board to help this cause. Everyone no matter where you live in Muskoka, Severn, Parry Sound or further. This isn’t a small concern, the impact and destruction could have enormous effects to our Muskoka life style, Tourism, wildlife, our clean air & clean water. There is an information meeting at the Ullswater Hall on June 10th sponsored by the quarry proponents. The next crucial Twp Of Muskoka Lakes planning/council meeting is at Port Carling, Friday June 16th 9:00 am. Please try to attend this meeting, your interest and attendence will make a difference. I am writing regarding the proposal to amend the Official Plan and Zoning By-law related to the Lippa Pit and Quarry application to rezone from Rural to Rural Industrial that will be considered by Council at its June 16, 2017 meeting. This letter is to express my strong opposition to that rezoning application. In 1974 I purchased the Burwash Schoolhouse built by Arthur Middlebrook Senior in 1896. At 1002 Tribble Road, it sits on almost an acre of Lot 6 Concession 4 (See attached map). As you can see from the attached map, my property is at the corner of the Aspdin Road and Tribble Road, just kitty corner from where Butler Mill Road meets the Aspdin Road. Not surprisingly, my quality of life, health and the peaceful enjoyment of my property in the beautiful Muskoka woods would be devastatingly affected were the pit and quarry proposed by Mr. Lippa allowed to operate out of 1089 Butler Mill Road, north-east of Aspdin Road. Over the years I have worked hard to maintain and improve the building and property, such that it has been recognized as one of the few remaining log schoolhouses in Muskoka still intact and in pristine condition, as recognized in the book Schoolhouses in Muskoka. While I live in Toronto, I currently spend long periods of time each season in my Muskoka home. Should this proposed pit and quarry be approved, I would not only suffer a reduction in the value of my property but I would no longer be able to spend time here. As a senior I am very concerned about the negative impact on air quality from the dust pollution that is integrally connected with this type of industry. The quality and purity of the air in Muskoka has always been a key factor in my love of the area and the reason so many tourists want to visit it. As well, the noise and vibration from heavy truck traffic potentially carrying the annual extraction of 200,000 tonnes of sand, gravel and bedrock, on average 150 trucks per day at capacity, 7 days a week from early in the morning till 9:00 at night, as well as the additional noise from blasting, would make life there impossible. With 80% of the annual tonnage shipped from June 1st to November 30th the tranquillity and beauty of the lovely summer and fall months would be destroyed, not just for me, but for all the residents and tourists who come to this part of Muskoka, particularly during these months. As well, this dramatic increase in traffic from the number of haulage trucks will seriously degrade both roads, and as Muskoka taxpayers we will all have to pay more for their upkeep. Safety is also a key consideration for me, in my opposition to the proposed pit and quarry. Like my neighbours (there are 20 homes within 1 kilometre), I go for regular walks on both the Aspdin and Butler Mill Roads. If, as estimated, one truck will leave the quarry every 4.4 minutes, it will no longer be safe to walk on the roads closest to my property. The Aspdin Road is a very scenic route used by cyclists, school buses, mail deliverers and pedestrians. It has many hills, curves, blind corners and hidden driveways that can make it a challenge to navigate at the best of times. This much additional truck traffic will pose a real danger to public safety and a deterrent to tourism in this area. Additionally, the increase in pollution from haulage trucks and from particulate matter from resource extraction will be a major environmental and health risk to those of us (humans and animals) having to breathe these toxic fumes on a daily basis. Like other residents of this area, I get my water from a well, and am thus very concerned about the potential danger of contamination of ground and surface water caused by blasting, hauling and other operations. As well, the land for the proposed quarry sits within the watershed of Skeleton Lake, a lake known for recreation and tourism. Streams that originate in ponds on the property of this proposed pit and quarry will ultimately end in Skeleton Lake, seriously threaten the health of the lake and destroy wildlife habitat. It is not just humans who would be adversely affected if this proposal is approved. The proposed quarry would sit on land that is habitat for a wide variety of wildlife whose lives would be greatly disturbed by such an invasion. Over the many years that I have walked down Butler Mill Road and to the old mill which is on the site of the proposed quarry, I have seen moose, deer, bears, foxes, mink, beaver, and porcupines. The land of the proposed quarry is also home to many species of birds, including some of special concern such as the Eastern Wood Pewee and the Wood Thrush, and is the wintering grounds for the Snapping Turtle, a species to which the provincial government recently extended additional protection by banning hunting of the species. Please uphold this vision and commitment and help us keep the Aspdin area and Skeleton Lake home to a safe, healthy and diverse ecosystem by denying this application. Please don’t make a decision that will adversely affect the beautiful natural tourist attraction that this area of our Muskoka is. I am writing this letter to express my strong opposition to the proposed Lippa quarry. As so many have already stated, this project would negatively affect the water, wildlife, safety, health, and overall quality of life for so many. In my opinion, these factors alone are ample reason for you to unequivocally turn down the proposed pit. However, there is one factor I would like to focus on primarily in this letter and that is the issue of noise. No study can claim it won’t exist, because it will. Period. There is no legitimate way for any individual or paid corporation to downplay that fact or pretty it up. The noise from the proposed quarry would ruin the area for so many. Cottagers and homeowners come to the lake, and live in the Aspdin Road area, in large part to escape noise, to bask in the tranquility that is so difficult to find in the city. This is no small gift. Skeleton Lake and the surrounding area is one of Muskoka’s most beautiful treasures. The thought of allowing someone to desecrate it at all is disheartening beyond words. The thought of allowing someone to desecrate it for personal profit is worse.In closing, I would like to say that the heart of this matter is a matter of the heart. And isn’t that what Muskoka is all about? Petitions have been signed by hundreds of people who have a deep love for, and connection with, Skeleton Lake and the surrounding area. By people who find much-needed peace in taking quiet morning canoe rides, sitting on the dock during the day gazing at the amazing clear blue water, and falling asleep at night to the echoing laughter of loons. The deep love people have for this area CANNOT be overlooked and it CANNOT be underestimated. To me, it’s not only a factor, it is THE most powerful factor of them all. So please factor it in and factor it in big. So many times in this world, the voices of those who stand as quiet stewards of the sacred are shouted down by the raucous. Too many times, money-fueled bulldozers rip through holy ground, uncaring about the carnage left in their wake. Time after time after time, the heart’s lifeblood connections are kicked to the curb by those who stand to benefit from its destruction. This time, let the stillness of a Muskoka night speak louder than the demands of those who care nothing for its quiet offerings. This time, let the hearts of the people be the deciding factor, not the blatant motives of a would-be profiteer. This time—for all the times when it seems not to—let love, laughter, and future generations win.